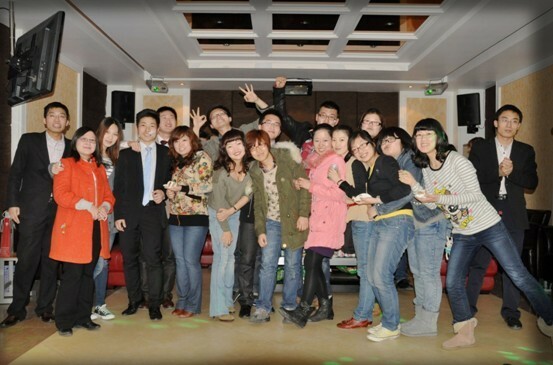 On the night of March 16, 2011, whole stuff of Zenith second group gathered in KTV that located on the sixth floor of Company headquarters. They prepared the cake and gifts in the Default location, kept everything in silence and secret. At 18:30. The protagonist has finally emerged In the midst of applause and cheers. They are not birthday person but the New stuff who will go abroad -----peter and Iverson! "They will left this week, and it’s the first time to go so far alone, but I ‘am not worried." Mention of peter, his teacher –lucas has much to say: I never check the email that replied to customer by peter, Because I am assure! Also I appreciate his unique and sincere way of communicating with people. He can insist on doing a little thing so well, I believe he will accomplish a great deal in the new world. "I have to say!" a new employee named Lucia grabbed the micro phone said: "When I hear that they will left, the first reaction is that there will lost lots of laughing in future, I really appreciate he help me so much. But for them, it is a very good opportunity and exercise, they are able to take the important task so quick, I admire! Zenith majordomo Alex can’t help but spoke out: "Please rest assured, we will make every effort to support your work, looking forward to a victory march!" what’s more, brother David was willing to share his successful abroad experiences with them. This well-prepared party, also attracted many colleagues outside the department involved. Colleagues from Culture Communication Ministry also sent their blessing on behalf of company: "It seem to recall that you fought with rivals on the basketball court to win the final fight scene. We sure you will unyielding in the sales battle, rushed courageously, and await you carry forward the zenith Brand spirit. Everybody talking actively, for a time, the whole hall full of blessings and touching. Face to the concerns form the heart of so many company leaders and colleagues. Peter and Iverson Also made statement: they Will stick to the customer’s interests first, Practical learning, defy hardships, Making zenith machine gain more recognition in worldwide. Interestingly, the first letter of their English name is a combination of "PI", namely proforma Invoice, means seller offer potential buyers a quoted price, that indicates Conclude a business.